The book publishers love readers like me. As a child I loved to read – when Scholastic did their orders in school, classmates might order 1 or 2 books. I ordered one of each. And I read them all too. As an adult, I still love to read. I buy a fair amount of books and I also bring home stacks from the library. My favorite books to read are mysteries, action & adventure, memoirs, and non-fiction. 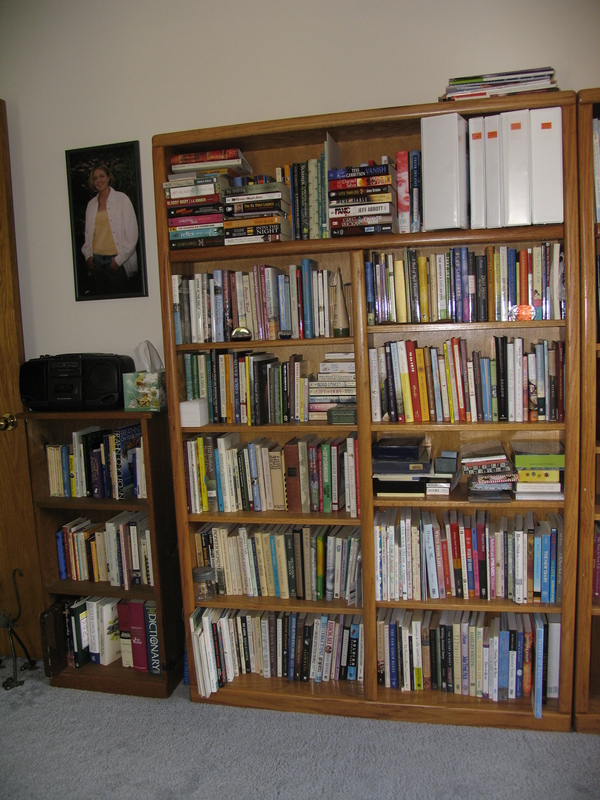 This is not the only set of bookshelves in my house either! Word for tomorrow – STATED. If you prefer to work ahead, see the list for the week under “A Word A Day”. I love books, but fell in love later in life. I will check out the sidebar. Great photo!! So glad to hear someonelse is as crazy about books as I am! I could never give them up for an e-reader, like my husband has. I so love to hold a book between my hands, turning pages after consuming all the words written on them. The accompanying photos put me at the scene of the action. Even after I’ve done with reading some books, I hold on to them, why I don’t know. Maybe because as a child I could never afford books of my own. Now that I can, I can’t let them go so easily. Yes, we are two kindred souls adrift in a sea of words. I love that imagery! I could not do an e-reader either. I love the tactile feel of the book and I think paper is much easier on the eyes. My husband has a lot of trouble reading very well and we were surprised at how his iPad (bought for other reasons) worked for reading. He’s reading much more now than he ever did before. I keep my books forever. Some are on my shelves 20 years and more. I either get rid of books right away (not keepers) or not until I’ve read them many many times over. My husband and I went to a meeting last night where the 2 speakers lectured on different aspects of self-publishing. We were surrounded by so many lovers-of-books, all wanting to create their own, like me. It felt nice to be with kindred souls. For me it really seemed we’d all come out of the woodwork. But, of course, it’s new to me because I’ve just joined the group. I’m certain most of those present were old-timers. In fact one of the ladies in the audience showed the 2 books she’s just self-published, for which she is already receiving royalties. I’m rewriting a book I drafted several years ago and might try self-publishing later this year. I think it’s a great way to get published, especially with unusual or esoteric topics. Mine is on keeping a diary. It actually got rejected when I applied for an MFA program – I don’t think it was weird enough for them. You do have quite a collection of books. I have some I’ve kept, but thinned out some and donated them awhile back. I’m thinning mine all the time. They keep following me home from the bookstore though. Ah ha! It’s not just me that happens to!